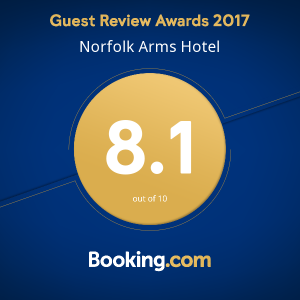 Guests staying at the Norfolk Arms Hotel have recognised the hotel as a ‘great place to stay’ by users of Booking.com, one of the world’s most popular hotel booking sites. Booking.com runs yearly Guest Review Awards with their bookers voting on common factors such as hotel facilities, cleanliness, room standards, quality of service and location. The reviews are carried out by registered guests who have actually stayed at the hotel ensuring all responses provided are authentic. 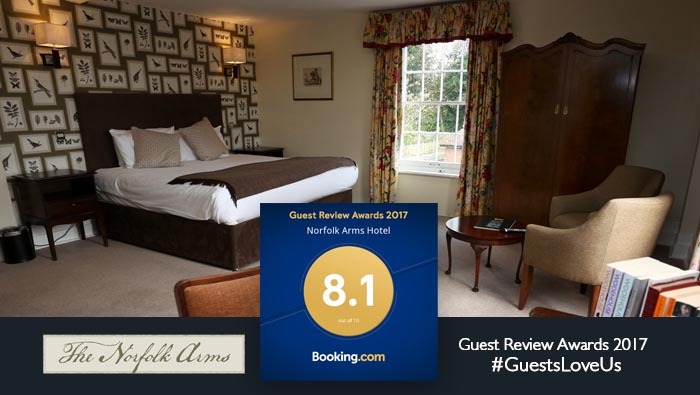 The Norfolk Arms Hotel scored 8.1 out of 10 in the 2017 awards, which included all reviews published on their website during the 24 months preceding 1 November 2017. Hotel Manager, Nicky Dibben, was delighted to receive the award on behalf of the hotel. She said: “It’s always pleasing to win an award, but to win one from arguably the world’s biggest online booking agent is a fantastic achievement. “The team work extremely hard to make sure that guest satisfaction levels are not only met, but exceeded, so recognition of this nature shows that we’re definitely on the right track. 2018 is set to be an exciting year for the hotel with some interesting changes. Most notably is the opening of the Norfolk Tap, a new craft beer and coffee shop, which will replace the current Town Bar. Refurbishments are on-going with an opening to be announced in the coming weeks.